This weeping chrysanthemum cherry produces exquisite rose-pink; densely double flowers with 50 or more pointed petals. Flowers can be over an inch in diameter. This compact tree with its arched drooping branches is ideal for small spaces. 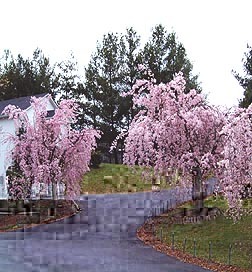 It is also called Cheal's weeping cherry. Flowering: Blooming Growth Rate: Fast growth rate Light requirements: Full Sun, Partial Sun and shade Plant Group: Tree Plant Type: Deciduous Plant Zone: Zone 5, Zone 6, Zone 7, Zone 8, Zone 9 Size at Maturity: 10 - 20 ft Size at time of shipping: one to two foot, two year old plants, ships bare root.